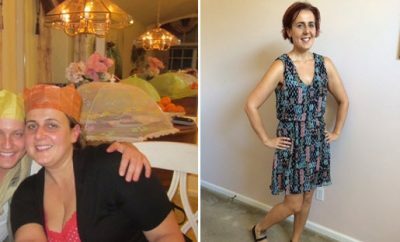 How I gained it: I was “normal” weight up until about the age of five. I lived with my grandparents in a large house of six-plus people at any one time, because my mom wasn’t around, and my grandma was a comfort eater. We snacked and dined out all the time, often with her telling me, “don’t tell anybody.” I remember being in kindergarten and coming home from school, taking four or five slices of plain white bread and eating it as a snack in front of the TV. By second grade, I was heavier than all the kids in my class, and this trend continued. Despite my weight, I was popular and never had a problem making friends. I can recall a few fat jokes from time to time, but I wasn’t tormented or teased by the other kids, I guess because I was so friendly and outgoing with everyone. In part I wonder if I had been made fun of more, if it would have encouraged me to lose weight sooner! As it were, I ended up a 220-pound senior in high school. After high school, I continued eating what I wanted — lots of breads, soda, sweets, comfort food, alcohol and fast food — until I hit 235 at the age of 21. Exercise was a bad word; I was as sedentary as sedentary could get. I avoided physical activity like the plague. By the time I graduated college and obtained a well-paying full-time job, I had reached 268 pounds and I was sick of myself. Breaking point: My whole life, I’d always been bigger than my friends. They were able to wear the cutest clothes and trade and share outfits while I sat by in my oversized jeans and t-shirts and watched. I drowned my sorrows in food and alcohol and pretended it didn’t bother me. 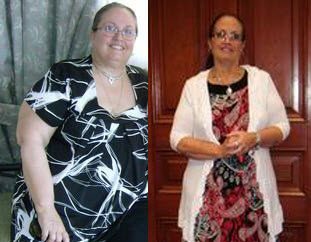 I had tried several diets — ranging from Atkins to calorie-restriction to liquid to the three-day diet and starvation. I might lose a few pounds here and there, but it was more work and less reward and I never stuck with any of them very long. In the summer of 2008, I was in an alcohol-related car accident which left me without a car. I was depressed and tired of how I was living and needed a change. I was taking the bus to work and my social life had completely halted. I sat around the house all day, munching on this or that, hating what I had become. It seemed now the only thing I thought about was eating and food and more food. It was time for a change. How I lost it: While moping around the house, I happened to spot a copy of “The South Beach Diet” that my mom had actually found in a shopping cart a long time ago and brought home. An avid reader, and desperate for anything to help, I picked it up and starting reading. Immediately, it was like a light came on. I understood why I was fat, and saw a clear path to success written amongst those pages. The book explained why it was the foods you eat and not how much of them that makes you gain weight. All my life the main foods I ate were the top three no-no foods on that diet: bread, pasta, white flour. Also, potatoes and sugar. It made sense and I was eager to begin to give it a try, although I was a little doubtful, being skeptic of all diets, having never found one that worked. I went to the grocery store that night, with my South Beach phase one shopping list in hand, and thus began my journey to weight loss. I stocked up on salad mix, chicken breasts, turkey, fresh veggies, skim milk, nuts, low-fat cheeses, eggs, turkey bacon and sugar-free jello. At that time, South Beach had some microwaveable entrees that I purchased a lot of as well, to take for lunches (they discontinued that line about a month or two into the diet!). The first week was a challenge, not eating the foods I usually ate, but by the start of my second week, I had dropped 10 pounds, with no exercise, and I truly was not having any cravings for the bad stuff! I continued on phase one for another three weeks (even though they recommend not to do this) and within that first month, lost 20 pounds. I started doing some light walking at night (meaning with very little effort). I’d put on my headphones and just regular walk, 20 to 40 minutes a night sometimes, around the neighborhood. At work, on my hour lunch break, I’d use 10-30 of my minutes to take light walks around the building and parking lot. 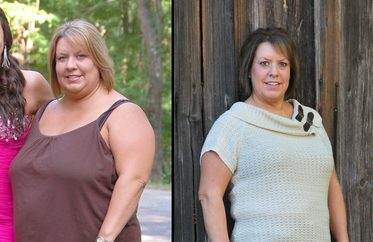 Within three months, I’d dropped down to 221 pounds — 47 pounds lost! I could not believe it! It seemed like that time had flown by without me even noticing and I loved the way I felt. I wouldn’t even dream of eating I even started to enjoy physical activity! I added interval training to my walks, which I had sped up a little bit. I started doing dance and workout videos and purchased some home gym equipment (balance ball, hand weights, resistance bands) to build some muscle strength. I had a Wii Fit, and used it to keep track of my progress, and also purchased some of the fitness games to add a little variety to my workout routine. 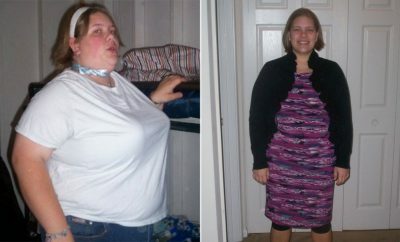 By Christmas of 2008, I was down to 200 pounds! My goal is 165, so I still have a way to go, but I am proof that it is possible. If you put your mind to it, change is possible. I never thought I’d lose that weight — ANY weight, for that matter — and here I am today. Always remember that change can happen in just one minute, your very next minute, if you decide that you want to implement it in your life! You can do it!